CORNET is featured in European Commission’s CORDIS news article as majorly optimizing manufacturing in the Organic Large Area Electronics sector together with the H2020 Factories of the Future SmartLine Project (www.smartline-project.eu). The news article is highlighting how Printed Solar Cells are transforming Electronics' Manufacturing, and some of the fascinating advantages Organic Electronics acquire, which makes them ideal for implementation in existing and new consumer products in a wide range of areas. HOPE-A together with the Nanotechnology Lab LTFN, the Aristotle University of Thessaloniki, Nano|Net Research and Innovation Network and the Horizon 2020 Projects Smartonics, Smartline and CORNET co-organized successfully the multi-event NANOTEXNOLOGY 2018. NANOTEXNOLOGY 2018 concluded on the 7th of July 2018, after an exciting week of innovative scientific, technological, business and networking parallel events. The ISSON18 Summer Schools kicked off this year’s NANOTEXNOLOGY on Saturday 30th of June. ISSON18 comprised fascinating lectures and demonstration of state-of-the-art techniques on Nanosciences & Nanotechnologies, Organic Electronics and Nanomedicine gathering more than 110 students from 28 different countries and 24 internationally acknowledged experts! Coming next, ISFOE18, the International Symposium on Flexible Organic Electronics started on Monday 2nd of July consisting of more than 150 presentations from 35 different countries, to be followed by NN18, the International Conference on Nanosciences and Nanotechnologies, which began on Tuesday 3rd of July encompassing 380 presentations from 50 different countries. During the same day, the I3D18 - Workshop on 3D Printing, 3D Bioprinting, Digital and Additive Manufacturing commenced and was a new addition to NANOTEXNOLOGY multi-events, gathering 150 presentations from 25 countries. During the fourth day of NANOTEXNOLOGY, inspiring Plenary talks were delivered by three world-class experts, Prof. T. Anthopoulos from KAUST Saudi Arabia, Prof. M. Stevens from Imperial College London UK, and Dr. A. Tomar from Jaguar Land Rover UK. The Plenary Session attendants were informed about cutting-edge updates on Plastic Nanoelectronics for the Internet of Things, Bio-responsive Hybrid Materials for Regenerative Medicine & Biosensing, and Applications of Printable and Organic Electronics in Automotive! This year 6 new parallel Special Workshops enriched NANOTEXNOLOGY’s programme with more than 150 presentations. On Monday 2nd of July, the HOPE-A & IAPE (Industrial Alliance of Printed Electronics of China) Joint Workshop took place, bringing forward the cooperation between the two Associations. The Workshop highlighted the technology and entrepreneurial activities of HOPE-A and IAPE members in Greece and China on Organic Electronics and promoted their interaction. In the Workshop on EU Projects on Nanotechnologies & Advanced materials for OPVs and Perovskites, Projects’ Coordinators and Participants gave an overview of the progress on the field bringing updated knowledge to Stakeholders. The New Business development & Commercialization Workshop, realized on Friday 6th of July, aimed at fostering actions on the exploitation and commercialization of scientific research and innovations and informed the audience of opportunities for funding at the European level. Parallel to the Conferences and the Summer Schools, EXPO18, the 8th International Exhibition on Nanotechnologies, Organic Electronics & Nanomedicine gathered more than 50 exhibitors, creating a vibrant environment of business interactions, together with the Matchmaking Event, which comprised more than 180 bilateral meetings, and the Business Forum with presentations from companies' representatives. Thank you for your contribution to this exciting multi-event and for visiting our Booth! We wish your participation in NANOTEXNOLOGY 2018 brought you fruitful discussions, networking and stimuli! Προσκαλούμε τα μέλη του Ελληνικού Συνδέσμου για τα Οργανικά και Εκτυπωμένα Ηλεκτρονικά (ΗΟΡΕ-Α) σε Τακτική Γενική Συνέλευση τη Δευτέρα 02/07/2018 στο Porto Palace Hotel (28ης Οκτωβρίου 65, Θεσσαλονίκη 546 28) και ώρα 15.00, ως Συνέλευση εξ αναβολής της τυπικά οριζόμενης στις 25/06/2018. Η Γενική Συνέλευση ξεκινάει με το κοινό Workshop που διοργανώνει ο HOPE-A με τον Κινέζικο Σύνδεσμο IAPE (Innovation Alliance of Printed Electronics of China), με σκοπό την αλληλεπίδραση των μελών των δύο Συνδέσμων και τη δημιουργία συμπράξεων. 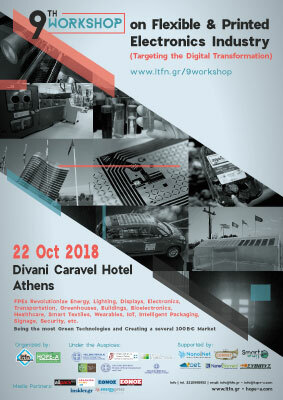 Στο Workshop θα παρουσιάσουν τα μέλη του ΗΟΡΕ-Α, A. Hatzopoulos S.A., Advanced Polymers and Hybrid Nanomaterials Research Lab του Πανεπιστημίου της Πάτρας και Organic Electronic Technologies P.C. Τον IAPE, τα μέλη και τις δράσεις του θα παρουσιάσει ο Αντιπρόεδρός του, Καθ. Li Luhai, και την εταιρεία Suzhou NanoGrid Technology θα εκπροσωπήσει ο Καθ. Zheng Cui. Μετά τη λήξη του Workshop, ώρα 18.00, θα ακολουθήσει συζήτηση των μελών του HOPE-A επί των θεμάτων που αφορούν στον Σύνδεσμο. Συζήτηση για την αξιοποίηση των συνεργασιών του Συνδέσμου με τους διεθνείς συνεργάτες του, και των αποτελεσμάτων από τη συνάντηση του Προέδρου του, κ. Στέργιου Λογοθετίδη, στο CPES2018 με τον Πρόεδρο του Καναδέζικου Συνδέσμου intelliFLEX, κ. Peter Kallai, για συνεργασία των μελών των δύο Συνδέσμων. Κατά τη διάρκεια του πολυ-γεγονότος NANOTEXNOLOGY 2018, θα υπογραφεί Μνημόνιο Συνεργασίας του ΗΟΡΕ-Α με τον εκπρόσωπο του Συνδέσμου KoPEA (Korea Printed Electronics Association), Καθ. An-Jung Chung, και θα τεθούν οι βάσεις για την εύρεση τρόπου επικοινωνίας και συνεργασίας των μελών των δύο Συνδέσμων. Φυσικά πρόσωπα από 200€ μείωση στο 50%, ήτοι 100€. Άλλοι φορείς από 500€ μείωση στο 50%, ήτοι 250€. Μπορείτε να κατεβάσετε την πρόσκληση από εδώ.